Princess Louise was the 3rd child of King Edward VII and Queen Alexandra. She was born on 20th Feb 1867, Louise Victoria Alexandra Dagmar. Her maternal grandfather was King Christian IX of Denmark. She was brought up at Sandringham and educated at home. In 1889 she married the Duke of Fife who was her 3rd cousin. They had two daughters, Alexandra and Maud, who, on the orders of the king were titled princess. Alexandra married Prince Arthur, Duke of Connaught. Princess Louise became Princess Royal on 9th Nov 1905. She was the 5th princess to have this title. Princess Charlotte, after whom the regiment was titled in 1788 was the 3rd Princess Royal. The present Princess Royal, Princess Anne is the 7th princess to hold the title. Princess Louise did not become the Colonel-in-Chief until 1914 but she had a special regard for the 7th Dragoon Guards since assuming the title of Princess Royal. She presented a new Standard to the regiment on 5th April 1906, the first time that a 'Princess Royal' had attended a parade of the 7th. On this occasion she presented the officer's mess with a silver cup, and the sergeant's mess with a silver cake basket. 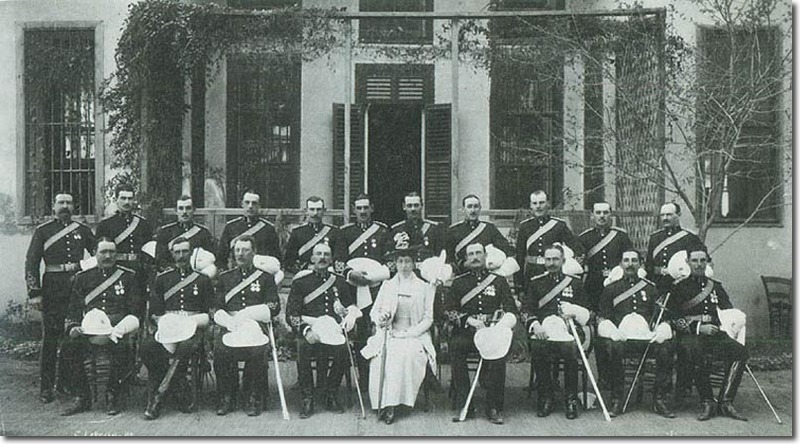 The next time she visited the regiment was while they were in Egypt, on 19th March 1910, the date of the above photo of herself with Lieutenant-Colonel Dietz and the officers. The following year she and her family were sailing off the coast of Morocco when the ship was wrecked. They were rescued but the Duke caught pleurisy as a result of the mishap and died soon afterwards. The appointment of the Princess Royal to the position of the regiment's first Colonel-in-Chief was announced in June 1914. But the 7th Dragoon Guards only had 8 more years left before amalgamation. Her position ended in 1922 when the 4th and 7th Dragoon Guards became one regiment. The 4th had no Colonel-in-Chief so Princess Louise was pleased to accept the appointment as Colonel-in-Chief of the 4th/7th Dragoon Guards on 20th Nov 1922. She remained in the post until her death on 4th Jan 1931. The next person to hold the title was the Duchess of Kent, in 1977.